Sixt makes car rental at Fort Lauderdale Airport easy by offering a large selection of top quality vehicles in a range of styles. No matter what kind of trip you have planned, we have a car rental to accommodate. Choose from compact cars and sedans, sports cars and convertibles, and full-size SUVs. If you are traveling with a larger family or group, Sixt car rental at Fort Lauderdale Airport also offers great deals on passenger van rentals to allow everyone to travel in comfort. While booking online, add extras like a GPS, child seat, or coverage options to make sure all your necessary travel needs are met. Please be aware that we cannot guarantee a rental for a specific car model, only for the car category booked. 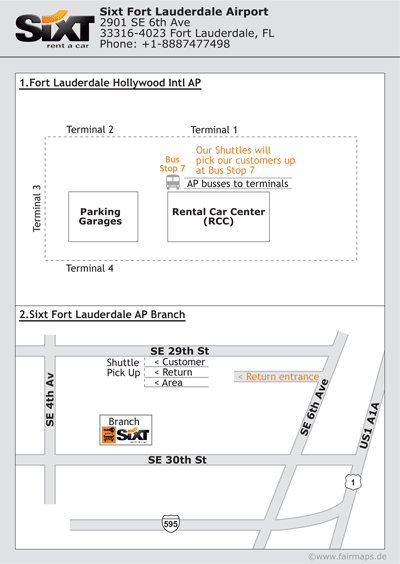 Our Sixt courtesy shuttle is available for transport to our Sixt station just three minutes off site from Fort Lauderdale Airport (FLL). At our Fort Lauderdale airport location you can try to reserve the vehicle of your choice 30 minutes prior to pick up with the Sixt App and take advantage of our 24 hour vehicle returns if needing to catch an early or late flight. We also have an Express Counter for even faster pick up of your rental car. Our Sixt Shuttle bus is running regularly within our opening hours and will bring you to our branch where you can pick-up your rental vehicle to continue on your travels. The journey only takes 5 minutes in our comfortable Mercedes-Benz van and is completely free of charge. Sixt lets you know where the bus is and when it will arrive through our live shuttle tracking. Welcome to the Sixt branch in the Fort Lauderdale Airport! Please note that this is an off-airport location, but we're only a short shuttle ride away. Please go up to Level 3 and locate bus stop 7 outside of the Rental Car Center. At bus stop 7, our orange courtesy buses will pick you up and bring you to the Sixt office. If you cannot find the pick-up station or have any questions about our shuttle service, please call our toll-free number: 1(888) 747-7498. Exit to I-595 E (State road 862 East, Port Everglades Expressway, towards Fort Lauderdale Airport), follow Exit 12B to Fort Lauderdale/US 1 North. Make a turn on North Federal Highway towards Fort Lauderdale and then a U-Turn at SE 28th Street. You will see our Sixt branch on the right side of US 1. Turn onto US1 Southbound (South Federal Highway) towards Fort Lauderdale Airport. After crossing SE 28th Street you will see our location on the right side of US 1. After picking up your Fort Lauderdale airport car rental the city is yours to explore. With your rental car, cruise the beaches along the famous coastal A1A Highway, shop and dine in upscale neighborhoods or head out on a road trip to the Florida Everglades. Fort Lauderdale offers must see sights and landmarks such as Las Olas Boulevard and the Riverwalk Fort Lauderdale as well as the Fort Lauderdale Historical Society which allows visitors to visit historic homes in the Old Fort Lauderdale Village. Scroll further for more travel options in the Fort Lauderdale area! Fort Lauderdale Beach: Enjoy the gleaming sun along some of the nicest sandy beaches of Florida. It's fun in the sun for the entire family! Hugh Taylor Birch State Park: Explore the great outdoors! This park is great for bird watching, kayaking in the lagoon and having some sports activities in the fields. Water sports and activities: Blue Foot Pirate Adventures, Sunrise Paddleboards, tropical sailing, or airboat rides are all available for nautical adventures in the Florida sun! With amazing weather year round, Fort Lauderdale is a popular place for snow birds looking to escape the cold. Sixt makes it easy to make Fort Lauderdale your winter vacation destination, whether you are on a shorter winter break or an extended stay. We offer a range of services to help you have the means to fully enjoy your time in the Florida sun. For example, our affordable one way car rentals let you can begin a family vacation in Fort Lauderdale and drive to Orlando or Miami for more sightseeing. If Fort Lauderdale will be your base for the entire winter, have a look at our deals on monthly and long term car rental.